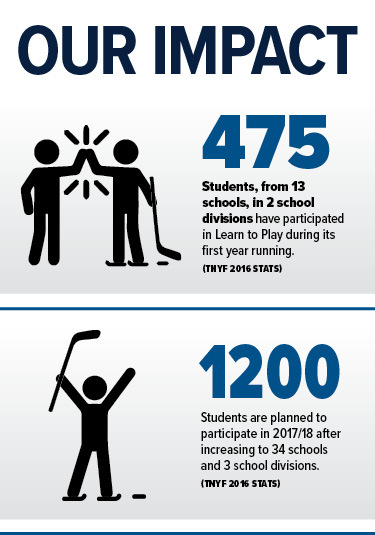 The True North Youth Foundation (TNYF) has embraced a new NHL initiative for underprivileged children to learn how to play hockey. Children between the ages of eight and nine are carefully chosen by their school divisions to attend the program once a week for ten weeks during the school year at their local community arena. The children are provided with free equipment from the NHL over a ten-week period and are also being monitored by Hockey Canada and Hockey Manitoba. Not only will they watch the children’s individual progress during the program, they will continue to do so to see if they still skate and/or play hockey once the program has finished. Learn about the True North Youth Foundation and the work that they do to ignite the potential in our communities youth.